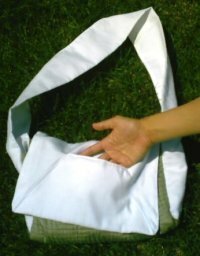 An Onbuhimo is a Japanese style carrier very similar to a Mei Tai, but instead of waist straps, an Onbu has two rings. I'm going to show you how to make an Onbuhimo from one placemat, one tablerunner, an accent fabric, and two sling rings. I found great coordinating sage green tablerunners and placemats at Target (soft, multi-layered, and easily washable). I used white thread, found a remnant of material also in white, and got two sturdy rings. The ones shown are clear acrylic, but I HIGHLY recommend slingrings.com for all your carrier rings. I sewed the straps to the top of the place mat at an angle that seemed right. Normal (sane) people would have actually measured the angle/distance between, etc. They might have also pinned. I just eyeballed it, pinched it into place and sewed both into place using the bartack stitch (small zigzag). Check out the symmetry! I followed the pattern of the fabric itself to sew the initial triangle, then I free-handed some loopy designs to fully secure the straps. I was in a rebellion-against-box-stitches mood. 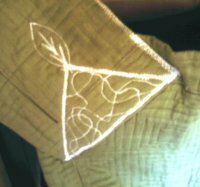 To top it off, I sewed a leaf at the top corner of each side. This was all using my Janome Hello Kitty sewing machine, which is surprisingly a real workhorse. I then took the accent fabric and doubled it over, sewed around 3 sides, and flipped it inside out. I stitched around the edges of that for a clean look. The rectangle shape I made was way longer than the width of the body of the Onbu (aka the placemat). I eyeballed some pleats (to make more of a seat for the baby), stitched them into place at the bottom of the placemat. Then I overlapped the body of the Onbu until the bottom edge was at the half-way point vertically on the rectangle of cloth. I bartacked it into place with a trapezoid shaped filled with freehanded loopy shapes. 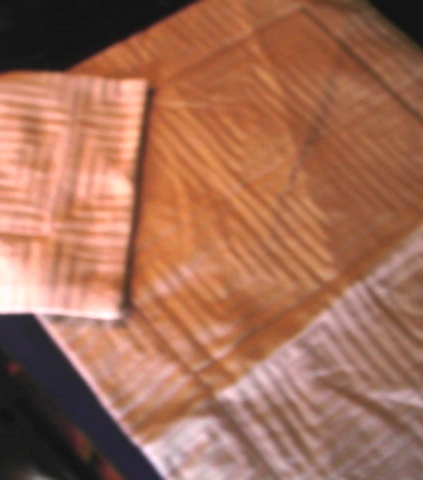 Then I took the bottom edge of the rectangle of fabric and folded it over onto the inside edge of the Onbu body, sandwiching the placemat in the white material. I sewed that firmly into place, stitching around the perimeter of the doubled rectangle, creating a narrower band of fabric which protruded out from either side of the bottom of the Onbu about 6 inches. That's my Onbuhimo! I hope I gave you some good ideas, and remember to choose your materials with care. Do not use single layer placemats or tablerunners that you can tear easily. Using upholstery weight thread can go a long way, just make sure you have a needle that can handle it, and keep in mind that the bartack stitch is one of the most secure out there. Check out my matching bag! Here is the matching diaper bag tutorial where I used the same white fabric and one placemat to make a matching diaper/carry bag for my Table Textile Onbu. That was very helpful for my college essay paper. Thank you very much! Interesting post ..! Thanks for share it . and view the contents of the article , it is very interesting to observe. Moreover this article that you make very high quality of so many health benefits that can be taken after reading the article that you created . For me the other benefits that can get inspiration to write on my own website . wow this is too good. So many students are searching for a research paper writing service that works for them. We are weak from paper writings but your blog writing tips simply superb, so may people are utilizing your services. I don't make carriers for money, as there are quite a lot of rules and regulations surrounding manufacture of baby carriers--depending on where you live. You can make this yourself! If you don't have a sewing machine, you can borrow one from a friend. This is a very easy project! This is good concept and babies will be comfortable to sit in this carrier. The working mothers in Japan usually use this carrier and they can take special care of their babies Dunham boots . It is made of very soft cloth. I am so happy to hear that you like your Janome Hello Kitty machine ;). I just bought my daughter the non- hello kitty version of this machine for her 7th birthday, it seems like a very good alternative to the usual children's toy sewing machines. I haven't tried it out yet. (the hello kitty machine costs nearly twice as much as the plain old janome/Kenmore one..and my daughter has a strange aversion to HK, probably my fault..I overdid the pink/kitty theme when she was younger). I emailed you, hoping I can help. OMG i am in need of a baby carrier and i googled it and your link came up i was wondering maybe you can help me out...e mail me at xoalleykatxo@yahoo.com. "Then I took the bottom edge of the rectangle of fabric and folded it over onto the inside edge of the Onbu body, sandwiching the placemat in the white material. I sewed that firmly into place, stitching around the perimeter of the doubled rectangle, creating a narrower band of fabric which protruded out from either side of the bottom of the Onbu about 6 inches." I guess I didn't explain that step very clearly. When the waist is constructed it's a wide rectangle. Fold the wide rectangle in half, opening facing upward. Then, place the bottom edge of your place mat, which is the bottom of the body of the carrier into the fold of the rectangle, sandwiching the body fabric between the two layers of the waist band. You could choose to add padding at this step also, just by tucking it in between the two layers of the waist. Sew around the perimeter, bartack, X-box stitch . .. whatever you choose to do, but make sure the body of the carrier is very firmly attached to the waist by more than one line of stitching. This is a great idea, I would love to try and make one myself. The piece of accent fabric- did you sew it to the placemat? Not sure how it fit in. As there is no regularity in the materials used, and all the materials suggested are repurposed, there is no way of knowing the safe limit of each carrier made with these instructions. 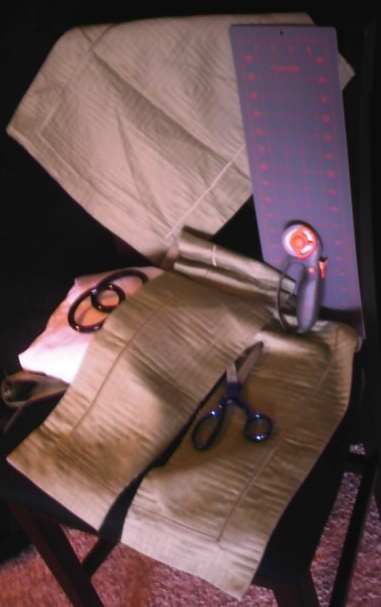 If you were to always use bottom weight twill, stitched, top-stitched, with internal x-box reinforcements, high quality thread, and quality sling rings, I would still have to make sure that the machine (and sewing techniques) were uniform. Then I would have to go through strenuous and expensive testing in order to arrive at a safe weight limit. Lacking all these standards of construction, all I can say is that the average place mat is rather narrow, so if your place mat onbu is well constructed, you'll probably want something wider and taller for an older child. 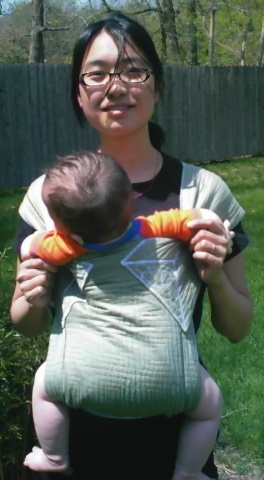 Speaking with great generality, this tutorial makes a good baby/infant carrier . . . not so much a good toddler carrier. I love this~so simple. I was wondering if you knew what the weight limit was on these? Similar to other carriers? I believe most are 35#. Everyone has a different body type, and a different baby. What digs in for one person might not for another. I personally do not have problems with the rings digging (with the onbu from the tutorial). How far the rings are placed from the body of the carrier will effect where they fall on your body. My suggestion is to sew one, try it out, and make changes if you find it necessary. A bartack stitch is a tight zigzag stitch. Google it, and you'll find definitions and pictures. that is so good, and nice to see how easy this is to do,and on a budget! The only thing is I recognize stitches but don't know their names - whats a bartack? Thanks so much for the full tutorial, I love all the details like using a design instead of the "X" box to sew on the straps. Leslie added a bag tutorial! Look above and you'll see that Leslie kindly added a tutorial for the matching placemat diaper bag. It is also listed in the "Make Diaper Stuff" section. That is fantastic. Love the fabric. The tute seems easy to use, even for those of us who are not great sewers. THANKS. 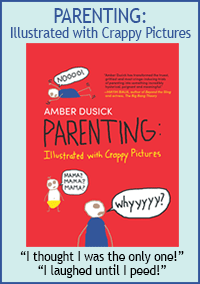 Great tute! Any chance you can let me in on the secret of the bag? I want to make on just like that! I've been looking for a carrier that could be made simply but in a heavyweight fabric. This is perfect. Your directions are easy to read, and I like the reccomendations that you made. Really great job, I love that you used placemats from Target, that is so inventive!